(High) fashion has been looking at skate for much longer than when Louis Vuitton paired up with Supreme on the Paris runway earlier this year. Actually, what feels like the last credible (youth) subculture has been a steady source of inspiration ever since its very inception. After sporting super loose baggy pants up until the early/mid-2000s, skaters started turning towards low-hanging skinny jeans later on in that decade before slowly exchanging these for looser bottoms again. Over the last few years, many of the cool skate kids between London’s Southbank to Paris’ Palais de Tokyo have in particular been favoring a real American classic: Dickies pants. Now that actual skaters are already turning their heads away from the brand, fashion is finally embracing the workwear staple – or at least, Urban Outfitters is – and even (finally!) adapting it to the women’s world. 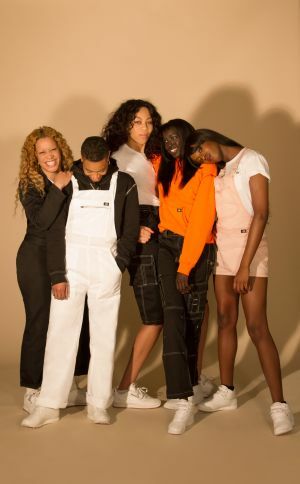 In their latest collaboration effort, the retailer has partnered up with Dickies for an exclusive “girls-only” line of classic workpants, sweatshirts, overalls, skirts, hoodies and backpacks that will become available later on this spring (between May-June). The respective campaign was shot by British-Ghanaian photographer Campbell Addy on five creative women from different fields: casting director, stylist and DJane Mischa Notcutt, queer filmmaker Nadine Davis, photographer Nadine Ijewere, model Nyaueth Riam as well as transgender activist Tschan Andrews. "I just thought about women that I believed to be making a real change and difference in their given field”, said Addy about his choice. Whilst these ladies already look fab in their workwear pants, bibs and overalls, we can’t wait to see more of such canvas goodness coming in for the ladies.